Human rights advocates have at times been critiqued for discounting or even undermining rights-holders’ efforts to promote change, constructing rights-holders as merely “victims” and adopting a “savior” mentality. Such practices risk increasing the marginalization and victimization of rights-holders, and at times can even recreate structural barriers to empowerment. But how have advocates responded to this critique in their practice? 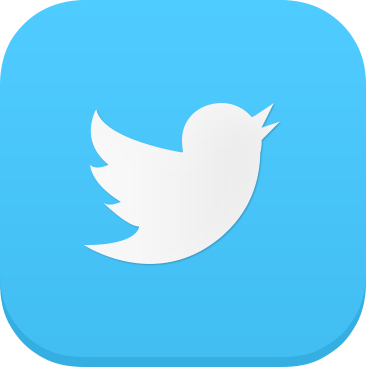 What have been some of the most difficult challenges to implementing a more critically-responsive form of practice, and how have advocates addressed those challenges? 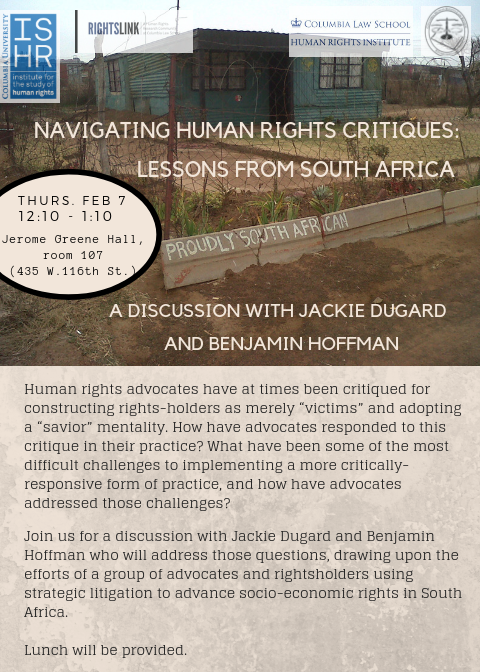 Join us for a discussion with Jackie Dugard and Benjamin Hoffman who will address those questions, drawing upon the efforts of a group of advocates and rightsholders using strategic litigation to advance socio-economic rights in South Africa. Jackie Dugard is an Associate Professor at the School of Law, University of the Witwatersrand. She served as a Senior Researcher at the Centre for Applied Legal Studies from 2004 to 2009, working on socio-economic rights-related research, advocacy and litigation. In Jan 2010, she co-founded and became the first Executive Director of the Socio-Economic Rights Institute of South Africa, a leading socio-economic rights NGO that engages in research, advocacy and litigation aimed at advancing access to socio-economic rights. Benjamin Hoffman is Deputy Director of the Human Rights Clinic at Columbia Law School. Ben's work and scholarship focus on the integration of community collaboration and co-empowerment in transnational human rights advocacy strategies and methodology. Prior to joining Columbia, Ben worked with EarthRights International in Lima, Peru, providing litigation support to communities from the Andean-Amazonian region resisting the harmful consequences of resource extraction and mega-development projects. He received his J.D. from Harvard Law School and his B.A. from the University of California, Berkeley. Introduction by Inga Winkler, Lecturer in Human Rights at the Institute for the Study of Human Rights. This event will be livestreamed at: https://echo360.org/section/df524bd1-88f5-4f25-8e84-ae8eb61bed86/public.